Forget about the recession – for the second time in four years, Irish shoppers will once again be the highest spenders in Europe this Christmas. A survey by Deloitte shows that even though the average spend per household has dropped, Irish households are still predicted to spend €943 over the festive season – down from €1,020 in 2010 and €411 less than in 2008. This puts Ireland marginally ahead of Luxembourg, which will spend on average €923 per household. The most frugal shoppers in Europe are the Dutch, who will spend an average of €260 per household. The annual Deloitte consumer survey of Christmas spending breaks down the Irish spend to find that the average amount to be spent on gifts will be €520, €259 on food and €165 on socialising. The survey, which took place across Europe, also asked shoppers about their most wished for gifts, with books and cash topping the list. Richard Howard, a partner a Deloitte said it was interesting to see Irish consumers have “regained the crown of top spenders in Europe”. The survey also found that 55% of Irish respondents will use social media to research or find information about gifts before they buy them. Email “What recession? Irish shoppers will be the highest spenders in Europe this Christmas”. Feedback on “What recession? 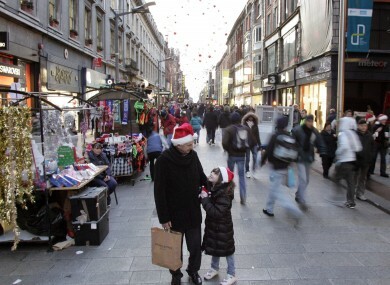 Irish shoppers will be the highest spenders in Europe this Christmas”.